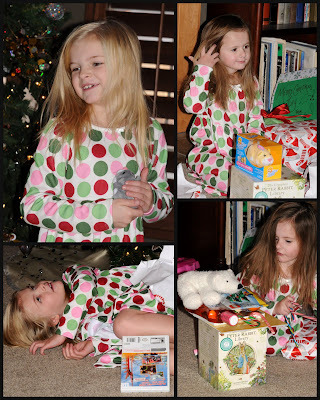 Christmas morning began at 9:00 when the girls wandered into our room. We made our way to the stairs by 9:15 for the annual stairs picture. Ivy was not excited about the picture- she said she was really tired. Good thing Jade was cooperative. 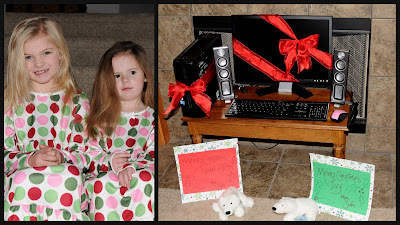 Their Santa present was a computer. (The monitor is a hand-me down) but we didn't think they would understand what just the tower was. The favorite thing about their computer was the super cute pink mouse that Scott found. Neither one of them expressed very much excitement over the computer. Ivy was far more excited that Santa brought her the new mouthwash that she had been asking for her "WHOLE LIFE". It's always wonderful when you can meet the needs and wishes of your children. 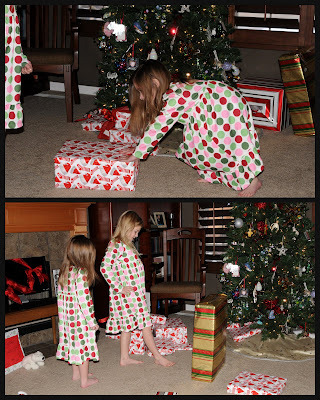 The girls distributed gifts and played the role of Santa. Some were a little too heavy so they were pushed. A couple presents were bigger hits than others. For example, the Zhu Zhu's were a smash! The girls loved them and cuddled them and kissed them. 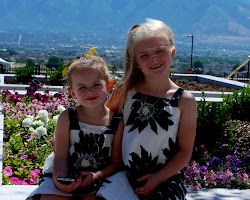 I loved that neither of the girls had ever heard of them before- so they had no idea how lucky they were to get them. As many of you may know, Scott is the best shopper EVER. He finds deals in places that no one would ever expect. Several weeks before Christmas he informed me that he had ordered two Zhu Zhu's and that they were the big toy of the season. He found them online at Shopko and paid the msrp for them- while others were paying outrageous amounts for these $12 toys. Jade's other favorite toy was a roller coaster game for the Wii. She fell over "dead" from excitement. Ivy loved everything she got and enjoyed stacking them into a tower. 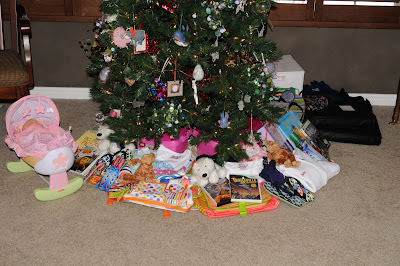 In the end, here's our display of Christmas presents. What did Scott and I get? Scott got a really awesome Rowenta iron. I got backdrop stands and backdrops. I'm so excited to start using them.